WASHINGTON – Arizona officials said Tuesday it is time to end the “gentleman’s agreement” currently governing states’ use of water from Lake Mead and instead put tougher restrictions into law. “Arizona needs more certainty that the water is going to stay in Lake Mead if we’re going to keep putting water there,” said Thomas Buschatzke, director of the Arizona Department of Water Resources. 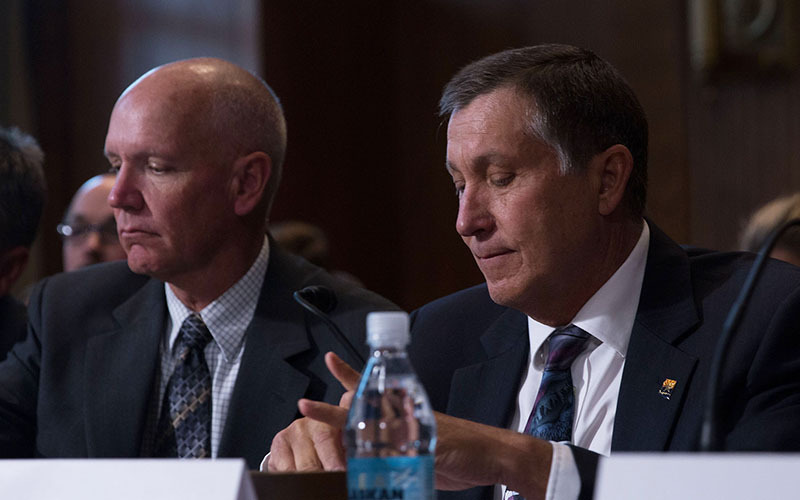 Buschatzke told a Senate Energy and Natural Resources subcommittee that so far this year, Arizona has put 165,000 acre feet of water it has conserved into Lake Mead, a number that is expected to grow to 215,000 acre feet by the end of the year. The state wants to make sure that water is there for its use in the future and is not taken out and used by other states as is happening now, he said. He was testifying in support of the Western Water Supply and Planning Enhancement Act, which supporters say would toughen the restrictions and prohibit states from drawing water that other states have put in Lake Mead. The bill was sponsored by Western senators, including Arizona Republican Sens. Jeff Flake and John McCain. 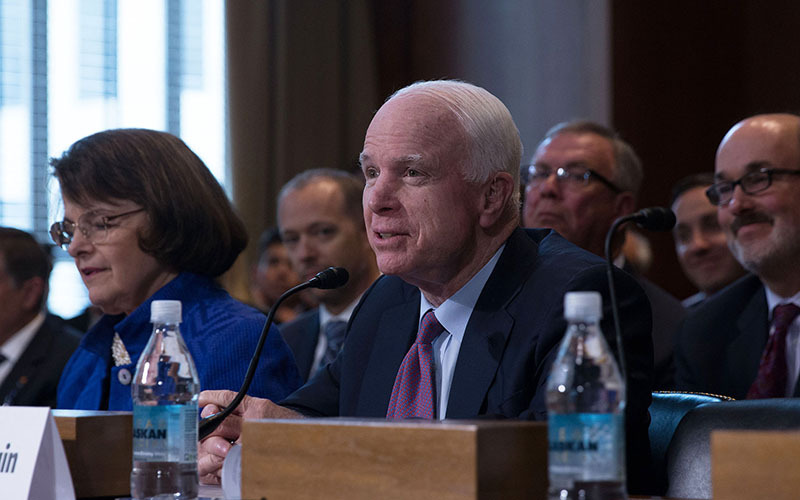 In his testimony at the hearing, McCain said the problem of drought in the West is a “crucial, critical” issue that requires collaboration between the states in the Colorado River basin, something he said the bill would encourage. But officials with the Bureau of Reclamation and Department of Agriculture called the bill unnecessary, saying it duplicates what the agencies are already doing. Bureau of Reclamation Commissioner Estevan Lopez noted that the section of the bill dealing with Lake Mead does not have consensus support from all seven states in the basin and could make collaboration more difficult, not less. Buschatzke described the current regulations enacted under the System Conservation Program’s memorandum of understanding as a “gentleman’s agreement” that calls on states to leave conserved water in Lake Mead. The bill would formalize that agreement, letting states draw on water contributed by other states only after the year in which the water was put in the lake. “This better incentivizes states to conserve water to prop up the elevation in Lake Mead,” Buschatzke said. Lake Mead elevations are a concern because if the water in the lake drops below a certain level it triggers a shortage declaration that requires water usage restrictions. Arizona has contributing to that effort by placing conserved water in the lake, and Buschatzke said residents and water officials want to see the water stay there to serve that purpose. Preventing Lake Mead from hitting a shortage point is of particular interest to states like Arizona, with the Central Arizona Project hit with restrictions before any are placed on California’s water use, Buschatzke said. He told the panel that many Arizona residents would like to see this water be put into the state’s water banks and the Central Arizona Project, and used within the state rather than put into Lake Mead. The bill would also require the Interior Department to implement a plan to control the invasion of tamarisk trees, or salt cedar, in Arizona. The invasive, water-intensive plant has “choked” many Arizona waterways, according to Buschatzke. McCain said that replacing salt cedar plants with native vegetation could save up to 860,000 acre feet of water.